Rue plant, Ruta graveolens, is sometimes known as Herb of Grace. One of the oldest medicinal plants. Leaves were an ingredient in witches brew in the Middle Ages. An essential part of the traditional folk medicine, the leaves were used to treat colic, eye problems, epilepsy, hysteria and vertigo. A companion plant. Note: Some people receive a rash after touching Rue on a hot day. 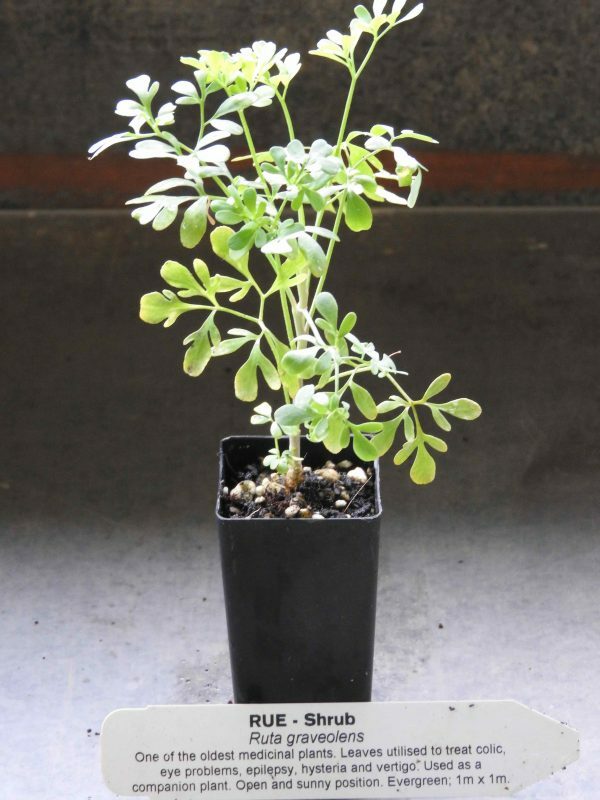 Rue plant is a native of southern Europe and is adaptable to most soils in an open, sunny position. Flowers are small, greenish, yellow and star shaped occurring in summer and autumn. Frost resistant but drought tender. An evergreen shrub, growing to 1m x 1m. Be the first to review “Rue, plant” Click here to cancel reply.